The dollar was the cornerstone of the monetary system devised by the Founding Fathers for the fledgling United States. More than two years passed, however, between the time Congress authorized dollar coinage and the actual production of the first such coin, the Flowing Hair silver dollar. Congress itself was responsible for the delay. As part of the basic Mint Act of April 2, 1792, the House and Senate specified that two key Mint officers—the chief coiner and assayer—would have to post bonds of $10,000 each before they could work with precious metal. The requirement was onerous: It represented more than six times the annual salary of $1,500 apiece provided for these two officers. Understandably, they had trouble meeting it—and, until they did, only copper coinage could proceed. Silver coinage started in 1794 with two denominations—the dollar and half dollar; both were identical in design (half dimes of this date were coined the following year). The dollar was deemed the most prestigious, so Mint officials decided to strike that first. Actually, the Mint had gotten a running start on the new coins: Engraver Robert Scot had been told to prepare designs for them months before the legal snarl was untangled. 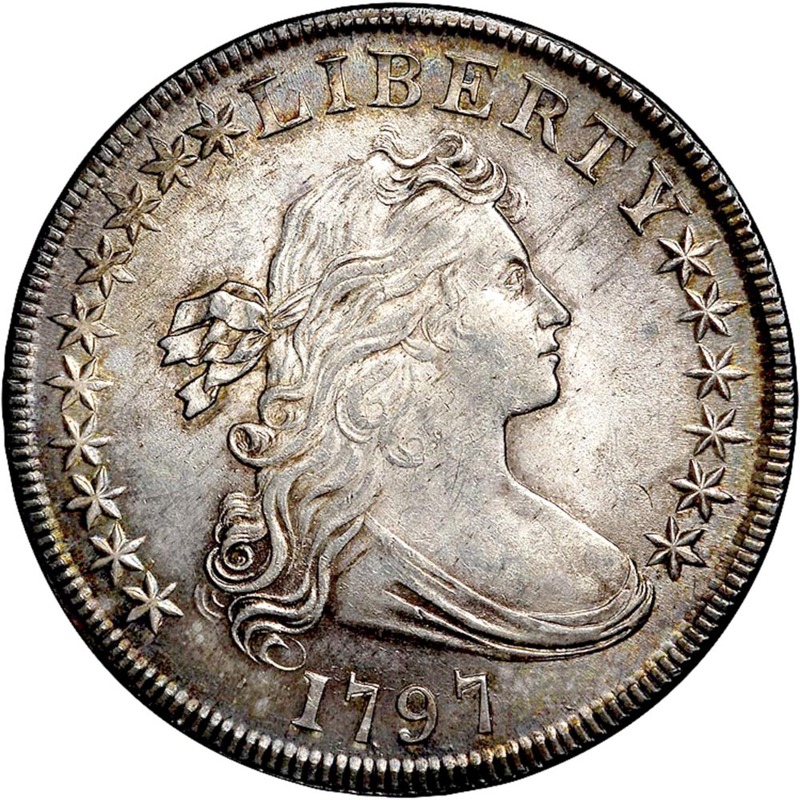 Congress had specified that the new coins should bear a design “emblematic of Liberty,” and Scot accomplished this with a right-facing portrait of a youthful female figure whose hair flowed freely behind her—hence the descriptive term “Flowing Hair.” The word LIBERTY appears above her, with the date below and 15 stars along the sides, symbolizing the number of states in the Union at that time. Scot is said to have meant the flowing hair to signify freedom. A pattern 25-cent piece of 1792 served as Scot’s model for the obverse; this had been designed by Joseph Wright, who died of yellow fever in 1793 after serving briefly as Mint engraver. The dollar’s reverse depicts a small, spread-winged eagle perched upon a rock and surrounded by laurel branches. Encircling this, along the border, is the motto UNITED STATES OF AMERICA. The dollar’s “third side,” the edge, carries the inscription HUNDRED CENTS ONE DOLLAR OR UNIT, with decorations separating the words. The Flowing Hair dollar is slightly larger and heavier than later U.S. cartwheels like the Morgan and Peace dollars. Its authorized fineness differs, too, but its actual fineness doesn’t, because of some curious doings at the Mint. Congress had specified a peculiar alloy of 1485/1664 silver and 179/1664 copper, for a fineness of .8924+. But Assayer Cox complained that this was too difficult to achieve and, what’s more, that silver coins would turn black in ordinary use unless they were at least .900 fine. He prevailed on Rittenhouse to let him use that higher standard, even though Congress hadn’t sanctioned it, creating an incredible situation where the Mint was actually breaking the law of the land. This led to substantial losses for people who deposited silver bullion with the Mint and took silver dollars in return, for they were being forced to furnish more silver per coin than the law required. Eventually, some sought and obtained reimbursement. Almost 170 years later, in 1964, a small box of “strange” coins was consigned to a Christies auction in London by the family of British nobleman Major Sir Roland Denys Guy Winn, M.C., Fourth Baron St. Oswald. The box contained about $10 in face value of new U.S. coins, dated either 1794 or 1795. Most notable of these pieces were two uncirculated 1794 dollars which brought $11,400 each at the sale. When the coins returned to the United States, the excitement generated among American collectors began to take on a life of its own. A story took root that had one of Lord St. Oswald’s ancestors traveling to Philadelphia in 1795 and receiving the coins directly from Henry DeSaussure, Rittenhouse’s successor as Mint Director. While this account makes fascinating reading and has been accepted as fact for over thirty years, recent research has uncovered that it’s based entirely on conjecture. No family records or accounts support the proposition of a trip to the United States by a St. Oswald ancestor; in fact, they tend to refute it. We don’t know for certain how the coins were obtained or by whom—only that they were in the St. Oswald family’s possession in 1964. Perhaps a future numismatic researcher will be able to unravel this mystery. Further dollar production was suspended until a new press—capable of imparting fuller, stronger strikes—could be installed. It didn’t resume until early May of 1795, and from then through mid-October the new equipment cranked out more than 160,000 Flowing Hair dollars dated 1795. In October, the design gave way to a new Draped Bust dollar, making the Flowing Hair dollar a two-year type coin. Despite its brevity, the Flowing Hair dollar series is widely collected by type (most collectors selecting the 1795 issue, because it is so much more plentiful than 1794). Some of the 1795 dollars have two leaves below each wing of the eagle, while others have three. Both kinds are equally available, however. There are no records of proofs for either year, but some 1795 dollars are purported to be “specimen” strikes. Mint state pieces of both dates are very rare. Points to first show wear are the cheek, shoulder and hair above Liberty’s forehead and the eagle’s breast, head and wing-tops. Flowing Hair dollars are coveted collectibles, not only because of their great rarity but also because they possess such a powerful link with the birth of both the nation and U.S. coinage. Silver dollars are enormously popular, so this short, small series truly was the start of something big. A precocious country during its formative years, the United States grew quickly in size and stature throughout its first half century as an independent nation. It didn’t reach maturity nearly as fast, however, as the likeness of Miss Liberty on U. S. silver coinage. When Liberty first appeared on the nation’s silver coins in 1794 she was youthful and vivacious, with her hair flowing freely behind her. Focusing on that feature, collectors refer to these coins as the Flowing Hair type. But it didn’t take long for this innocent- looking maiden to reach the full flower of womanhood: The very next year a new portrait showed her, in the words of coinage critic Cornelius Vermeule, as “a buxom Roman matron” having long, elegant tresses neatly tied back with a ribbon and a bow and ample cleavage visible above a fold of drapery. This full-figured portrait has come to be known as the Draped Bust design, and it holds a significant distinction: It appears on the obverse of the 1804 silver dollar, one of the most famous and most valuable U.S. coin rarities. For a time, the Draped Bust portrait graced all five silver coins then being issued: the dollar, half dollar, quarter, dime and half dime. The dollar got the jump on all the others, though, receiving this design partway through production in 1795. It didn’t make its debut on the other four coins until 1796. Selection of the dollar as the new design’s first showcase underscored the primacy of that coin. The dollar was the cornerstone of the monetary system devised by the Founding Fathers, and the one-dollar coin was not only the largest silver issue but, in the view of officials overseeing the Mint, the most prestigious as well as most important. They had made that clear in 1794 when they chose to have dollars struck before anything else at the outset of silver coinage, only then giving the go-ahead for the smaller silver pieces. Replacement of the short-lived Flowing Hair design coincided with a change in leadership at the Mint. David Rittenhouse resigned as the Mint’s first director at the end of June 1795, and his successor, Henry William DeSaussure, set out at once to improve the designs of all the denominations, particularly those struck in silver. Possibly at the urging of President George Washington, DeSaussure engaged portraitist Gilbert Stuart to fashion a new design for the silver coins. Stuart prepared a drawing of the Draped Bust figure, reportedly basing the portrait on Philadelphia socialite Ann Willing Bingham, said to be the most beautiful woman of her time. This sketch was translated to plaster by artist John Eckstein of Providence, Rhode Island, and the dies were executed by Mint Chief Engraver Robert Scot. Though the Flowing Hair portrait of Liberty was retired, the Mint kept the reverse essentially the same. It features a small, naturalistic eagle encircled by a wreath, with UNITED STATES OF AMERICA inscribed around the border. On the Draped Bust coinage, this “Small Eagle” reverse does reveal subtle refinements: The eagle seems more graceful, for example, and it’s perched upon a cloud instead of a rock (as had been the case on the Flowing Hair coinage). In addition, the wreath has been modified: The previous laurel branches have given way to branches of palm and olive. LIBERTY and the date are the only inscriptions on the obverse. Lettering on the edge proclaims the statement of value: HUNDRED CENTS ONE DOLLAR OR UNIT, with decorations separating the words. The entire first-year production of Draped Bust silver dollars took place in the last two weeks of October, 1795 and totaled a modest 42,738 pieces. That’s barely one-fourth the mintage of 1795 Flowing Hair dollars; some 160,000 of those had been struck earlier. Nonetheless, both types historically have commanded comparable premiums. The Flowing Hair dollar benefits from its wide appeal as a type coin: That series was made for only two years, and the 1794 is a major rarity, so the 1795 is the only realistic option for most buyers. The Draped Bust/Small Eagle dollar didn’t last much longer. It remained in production for only four years, from 1795 to 1798, before the small eagle was replaced by a large, heraldic eagle. The Draped Bust portrait retained its spot on the obverse until production of dollars was suspended in 1804 because of heavy melting. When dollar coinage resumed in 1836, the obverse bore a new Seated Liberty portrait. Only about 450,000 Draped Bust/Small Eagle dollars were issued in the four years combined, nearly three-fourths of them in 1798. Noted scholar Walter Breen estimated that just 3 percent survive. The low point came in 1797, when a mere 7,776 were produced. The rarest variety is the 1797 dollar with 9 stars to Liberty’s left, 7 to her right and small letters in the reverse legend. The low production figures are understandable, given the fact that during the 1790s a dollar represented a full day’s pay for some Americans—and a living wage, at that. Although the series is short, Draped Bust/Small Eagle dollars come in more than a dozen major varieties. Some of these distinctions are based on the size of the date and the inscriptions. Most of the varieties, however, are tied to the number of stars on the obverse and the way they are arranged. There were 15 stars in the first two years, representing the number of states in the Union at the time. With Tennessee’s admission, the number rose to 16 in 1797. Then, in 1798, it dropped back to 15 (apparently because old dies were being used) before ending up at 13 for the 13 original colonies. The collecting of this series by varieties took a major leap forward with the publication in 1950 of a reference book by Milford H. Bolender. Using his own specialized collection of these coins as a foundation, Bolender described and illustrated each variety known to him. After going through several editions, his book was extensively revised by Jules Reiver in 1998. Another reference by Q. David Bowers, with the assistance of Mark Borckardt, was published in 1993, correcting and updating the Bolender book and assigning a new numbering system. Thus, the varieties of these dollars are identified by either Bolender (B) numbers or Bowers/Borckardt (BB) numbers. Dollars of this type are scarce and highly collectible even in lower circulated grades and are rare in mint condition. Points to check for wear are the hair above Liberty’s forehead and the crest of the eagle’s breast. Although the series is short, it is generally collected by type alone because each component is so scarce. Proofs of these coins weren’t struck, but a few presentation pieces display prooflike surfaces. Throughout the 1790s heads continued to roll off the guillotines of France as that country struggled to affirm the democratic principles it had first espoused in 1789. Some Americans watched nervously from across the Atlantic and wondered if the violence of the mob would spread to this country. But America’s democratic principles were firmly established, as it had already undergone the national trauma of revolution, war and two changes of government since 1776. By 1798 democracy in America was beginning to come of age. This maturity of the United States was evident in the late 1790s not only by America’s refusal to be pulled into the war between England and France; it can also be seen in the changes in the nation’s unit of currency, the dollar. The design modifications of 1798 were actually grounded in events that began three years before. When a new and improved coin press arrived at the Mint in Philadelphia in the spring of 1795, it made improvements possible both in the quantity of coins produced as well as their quality. The new press was able to properly stamp out the large sized dollar coins and include all the design details in the finished product. The Draped Bust dollar obverse was designed by noted artist Gilbert Stuart in an attempt to elevate U.S. coinage designs to “world class” stature. This design marked a maturing of the “young” Liberty of the preceding Flowing Hair design to a more “matronly” concept of the emblematic national symbol. 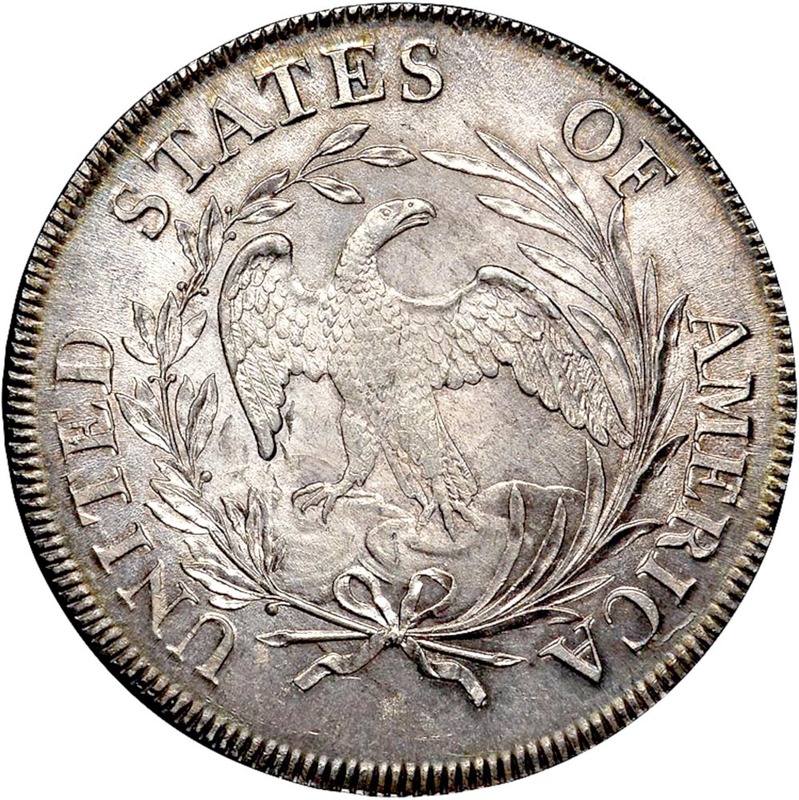 In 1798 the young hatchling eagle seen on the reverse of the earlier dollar was replaced with an older and more naturalistic eagle, one that was more in keeping with heraldic iconography. One oversight in the iconography of the Heraldic Eagle reverse, though, was in the placement of the arrows in the eagle’s right claw—the more honorable placement in heraldry—leaving the olive branch in the left or less honorable claw. This more warlike placement of the arrows was repeated on all heraldic eagle coins of the period. During the six years that Draped Bust Heraldic Eagle dollars were struck 1,153,709 coins were produced, all in the Philadelphia mint. There are dozens of die varieties, most involving only a minute difference in the placement of the stars, numerals, letters or other design elements. But there are several important design changes in the series that are of interest to a wide range of collectors. On 1798 dollars there are two different patterns of stars on the reverse above the eagle’s head. The earlier configuration, known as the “cross pattern” was a modification of The Great Seal of the United States, with the stars arranged in two triangular groups of six joined by a single star in the middle. The later design was much simpler. Known as the “arc pattern,” it had two parallel rows of stars: the top row had six, the second row five stars, followed by one star on either side of the eagle’s head. No one knows exactly why the star patterns were changed, but the earlier “cross pattern” configuration is generally the scarcer of the two. An interesting blunder occurred in the reverse stars in 1799. A working die was produced that had 15 stars, rather than the required 13. The error was discovered before any coins were struck, and rather than discard the die, the clouds were enlarged over the offending stars, covering all but the tips of these extra star points. In 1800 a die was cut that had an extra letter A at the end of AMERICA. The extra letter was polished away, but only the right portion of the letter was effaced, leaving what appears to be a letter I, thus creating the well-known AMERICAI variety. One of the most famous coins ever struck is considered a part of the Draped Bust series—the 1804 dollar. While the Mint struck dollars in 1804, all were produced from leftover dies dated 1802 and 1803, and no dollars were struck with the date 1804. However, thirty years later when several presentation sets of U.S. coins were needed for diplomatic gifts, the Draped Bust design was resurrected and dated 1804, as that was the last year the dollar coin had been struck. These were the so-called “original” or Class I 1804 dollars. The Class II and Class III 1804 “restrikes” were produced in the late 1850s for prominent collectors of the day. Only 15 specimens are known of all three types. No true proofs are known from this series but, as with the 1804 dollar, Mint officials were only too pleased to oblige collectors in later years. During the 1870s modern looking proof dollars appeared with the dates 1801, 1802 and 1803. These fantasy pieces are highly prized by collectors. Grading Draped Bust dollars can be a challenge. Certain die varieties are always weak on the stars above the eagle’s head because of die failure. Other varieties will show occasional areas of weakness due to die breakage. In high grades, signs of friction first begin to show on the highest points of the hair above the forehead and along the shoulder and bust line of Liberty. On the reverse, wear first shows on the clouds, then the eagle’s breast feathers. On weakly or irregularly struck coins, these design details may not be fully brought up. Counterfeits are known, and a number of fairly deceptive pieces dated 1799 surfaced in the early 1980s. These coins all have common characteristics and display dull, lifeless surfaces. Authentication of any questionable Draped Bust dollar is highly recommended. In lower grades Draped Bust dollars are widely collected by die variety specialists. Coins in XF and better condition are usually sought out by those who collect by date and major variety. For type purposes, most collectors want a single, high grade, problem-free example of a common, well produced variety. Such coins are quite elusive today and usually bring a substantial premium when offered. After 1800 silver dollars began to disappear from circulation. Many U.S. dollars were shipped overseas or melted for their high intrinsic value. Dollar production stopped altogether in 1804, and the next generation did not have a current circulating dollar coin until a brief artistic renaissance came to the Mint in 1836, led by Christian Gobrecht. Over the two centuries since their manufacture, the short-lived series of Draped Bust dollars has continued to be one of the most widely collected in U.S. coinage.